This is a sponsored post written by me on behalf of Bakewell PET Oven Bags. All opinions and text are entirely my own. I happen to love using oven bags because I almost never make a dry turkey. You can put everything for your roast in the bag (like root vegetables) and the whole thing is done quickly. This is perfect for a Sunday afternoon and then I have turkey sandwiches for the next week. Bakewell bags have some additional advantages over nylon bags. They are made from a synthetic, food safe material called PET and they are CLEAR. It makes it easier for me to assess the doneness of the turkey since it is easer to see. 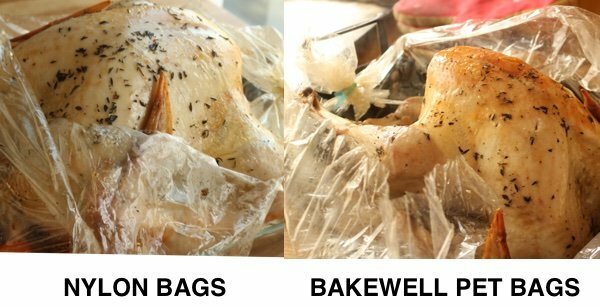 Bakewell bags also allow the bird to brown. I think it looks more attractive and the skin is crispier. Bakewell bags are recyclable and you don’t need to add flour to the bag or cover the bird in butter or oil. 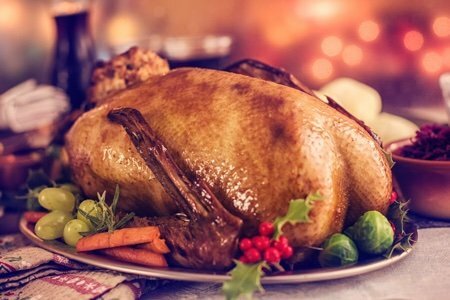 The turkey comes out of the bag delicious without any additional fat added. For more information on Bakewell PET oven bags check out the Bakewell Products Facebook Page. Heat oven to 350 F. Mix thyme with salt and pepper in a small bowl. Rub the turkey with the spice mixture. In a large roasting pan, place Bakewell bag and add carrots and potatoes. Add the turkey and close the bag with the included tie. Cut the corner of the bag to release steam and cook for about 2 hours or until the bird is 180 F.